Low estrogen in women can signify a change of physical functions in the body and many people are surprised to hear that low estrogen is responsible for their unusual symptoms. Estrogen is a hormone that plays a big role in maintaining good health. Although men produce estrogen, it is commonly thought of as a female hormone because women produce it at much higher levels. Hormones carry messages through the bloodstream that help start, stop, speed up, and slow down chemical processes in the body. 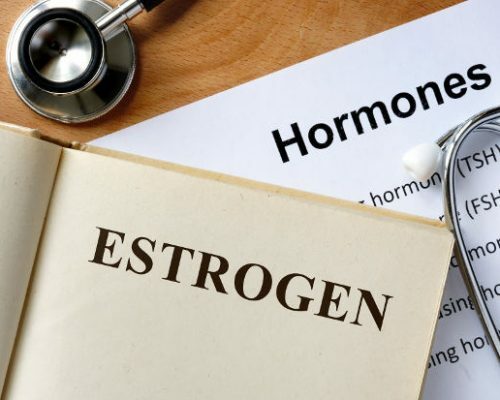 Estrogen is responsible for sexual development, bone and cholesterol metabolism, controlling menstrual cycles, and regulating food intake as well as weight, glucose metabolism, and insulin sensitivity. Do estrogen levels drop during menopause? It is normal for estrogen levels to drop at menopause. This usually takes place between the ages of 40 and 55, although if a younger woman has her ovaries removed, estrogen can decline suddenly. The first signs of a decrease in estrogen occur when a woman is going through what is called perimenopause, which is the transitional phase before menopause. Low estrogen levels and weight gain are linked to perimenopause along with other symptoms like hot flashes, irregular menstrual periods, and vaginal dryness. Some women become moody when their estrogen levels decrease and research shows that low estrogen levels can also increase a woman’s risk of heart disease, stroke, and osteoporosis. When it comes to low estrogen’s side effects, one of the biggest issues talked about by women is weight gain. Estrogen influences the amount of fat in the human body. The hormone helps regulate glucose and lipid metabolism, which is why low estrogen levels can lead to weight gain. Of course, women do have to be careful since being overweight can increase the risk of diabetes and cardiovascular disease. If you have low estrogen and think it is affecting your weight, don’t be afraid to discuss it with your doctor. He or she can give you advice on how to deal with it. Keep in mind that it’s always good to eat a nutritious, balanced diet and get regular exercise. There are a number of low estrogen symptoms that a woman can experience. Women approaching menopause are most likely to experience low levels of the hormone, but women at all different stages of life can develop low estrogen levels. with calcium and vitamin D to help keep bones strong. When you have low estrogen levels, there is a potential for decreased bone density. Low estrogen is most often linked to the ovaries since they are responsible for producing the majority of it. Young women may experience low estrogen due to excessive exercise, eating disorders, a low-functioning pituitary gland, chronic kidney disease, or Turner syndrome. Premature ovary failure, which can be caused by a genetic defect, an autoimmune disease, or exposure to toxins, can also cause low estrogen levels. Women who are 40 and over are most likely to experience low estrogen due to perimenopause. When a person no longer produces estrogen, they have officially reached menopause. There are some common risk factors for low estrogen, including a family history of hormonal issues as well as extreme dieting and eating disorders. The above conditions may or may not be related to low estrogen, but there are many situations where doctors can find a connection. Early diagnosis of low estrogen can help prevent complications later on, so if you think you might be experiencing some of the signs and symptoms of low estrogen then you need to see a doctor. During an assessment, your doctor will go over your family history and your symptoms as well as conduct a physical exam. It is common for blood tests to be ordered to measure hormone levels. If you are having night sweats, hot flashes, insomnia, or missed periods, the doctor will want to assess your estrone and estradiol levels. In some situations, a brain scan will be conducted to check for possible abnormalities that could be impacting the endocrine system. Low estrogen treatment varies, and it could involve hormone replacement therapy (HRT). Estrogen can be administered orally, topically or vaginally in women ages 25 to 50 who are experiencing low estrogen. The method and dosage depend on the severity of the condition. This treatment is not without controversy, as there has been some research that indicates it may increase the risk of heart problems, stroke, and cancer. Low estrogen is considered below 100pg/ml (picograms per milliliter). The good news is that there are also home remedies in addition to medical treatments that often help bring the symptoms under control. Not everyone responds well to medical treatment for low estrogen. There are also those who would prefer to go with a more natural approach. While there may be no immediate cure, many home remedies have been known to be effective treatments for many women. The following are methods that may bring you some symptom relief if you have low estrogen. Healthy eating: Lowering intake of carbohydrates and fats, as well as increasing fiber in the diet, can be helpful. Including foods that have naturally occurring estrogen (phytoestrogens) in them—such as soybeans, tofu, edamame, peas, and wheat bran—is also a good option. Fresh foods are also better than processed foods and avoiding high amounts of sugar can help keep estrogen in balance. Herbs: Some herbs are known to provide nutrition to the glands that produce estrogen. For example, chasteberry may be useful for increasing estrogen. Check with your doctor before taking any herbs as they may interfere with other medications. Exercise: Regular and moderate exercise, which is about 30 minutes per day, can help prevent obesity, heart disease, and diabetes, as well as helping to increase estrogen. Remember excessive exercise has the opposite effect. Stop tobacco use: Tobacco is known to indirectly lower estrogen levels. Some studies now suggest it may be linked to early menopause. Caffeine: Although surprising, studies suggest women who drink at least two cups of coffee or tea each day may be able to increase their estrogen levels. Whether you’re a woman over 40 going through perimenopause or a younger woman with low estrogen, you may experience mood swings, hot flashes, and weight gain. One of the biggest differences though is that younger women are still in their childbearing years, and if they are having difficulty getting pregnant, that too can be a sign that something is off with their estrogen levels. Abnormal hormone levels can be an indication of all sorts of health issues, so rather than suffer in silence and put your health at further risk, reach out to a healthcare professional to get a diagnosis and proper treatment.